No, Qantas is not an indigenous Australian word for the airlines trademark Kangaroo, like Singapore Airlines mythical Silver Kris bird. It is actually an abbreviation for the airlines earlier name, Queensland and Northern Territory Aerial Services. That gives you a clue as to how long Qantas has been in business. The airline is the worlds second oldest. It was founded in 1920 when flying was not everyday fare, but people needed to get between the far ends of the Australian continent. Back then, Qantas flying boats, complete with promenade deck and smoking lounge, were a major improvement over spending days on a train. Now the country’s flagship carrier, Qantas is again in a unique position. As a oneworld alliance member, it offers the best link between Australia and the rest of the world for both locals looking to get out, and non-Australians looking to visit. The only other national carrier, Virgin Australia, does not belong to a major airline alliance. For Australians, earning Qantas points is a cinch. They’ve partnered with major brands from pharmacies to gas stations to grocery stores. If you live in North America though, you’re not out of luck. Just last month Qantas became the newest Citi ThankYou Points partner. 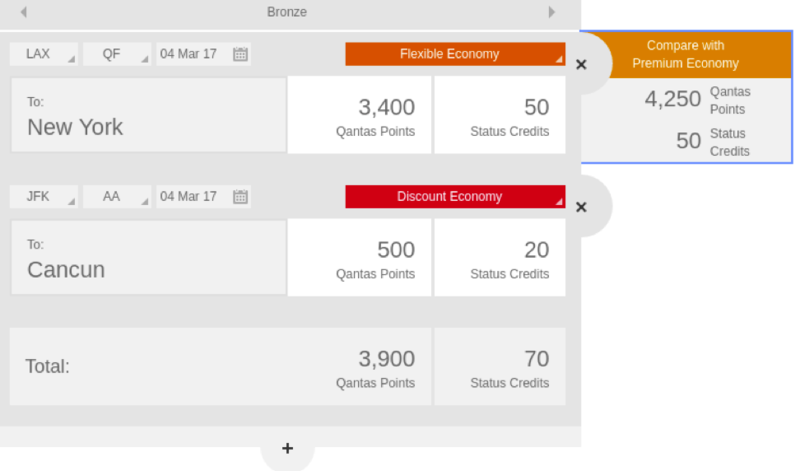 Since Qantas changed its earning program a few years back so each flight earns a set number of points based on the distance flown and the class of travel, credit cards are the best way to rack up Qantas points. How Can You Use Qantas Frequent Flyer Points? Qantas offers two different types of awards, Classic awards and Anytime awards. You should use Classic awards whenever possible, as they come with a host of benefits from lower prices to the ability to pay change fees with points. For Classic awards, Qantas uses two award charts, one governing flights on Qantas, Airnorth, Fiji Airways, Air Vanuatu, American Airlines, Emirates, Jetstar Airways, and another chart for all remaining partner airlines. Both charts feature distance-based awards. On the Qantas chart, awards begin at 8,000 points in economy, 12,000 points in premium economy, 16,000 points in business, and 24,000 points in first for one-way flights up to 600 miles. The price of an Anytime award depends on demand for the seat in question. The best value for your Qantas points comes when they’re used for upgrades, but these can be hard to come by if you don’t have status. A great runner up, however, is to fly Qantas partner Emirates within Australia for 54,000 points one way for a first class suite. The flight is short (around three hours), but if you’re looking to try Emirates renowned first class service without breaking the bank, Australia is the perfect destination. Qantas is known for gourmet tasting menus and impeccable service in first class aboard its sleek A380s, but you would never want to book that route with Qantas. First class awards can be as much as 384,000 points. 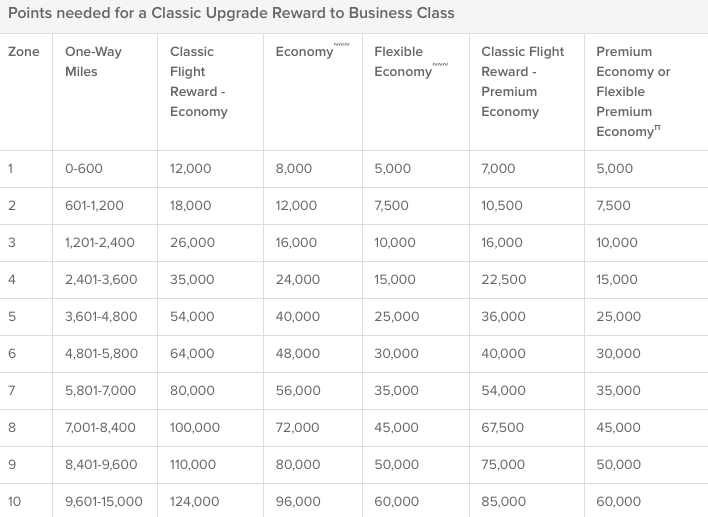 Upgrades on Qantas come in two flavors: Classic and Bids. Classic upgrades, like Classic awards, follow a distance-based chart, while Bids can be in cash, points or a combination of the two. Both types of upgrades are based on availability and status, so they can be hard to come by if you do not have high-level status with Qantas. Qantas partners with nearly every bank in Australia for an astonishing nearly 50 co-branded credit cards, but there are no co-branded Qantas cards available in North America.